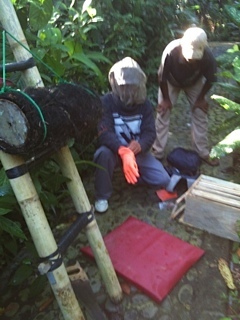 Some of our readers might already know about the Balinese bee hives that we set up some time ago in the organic garden. We started out with only few bees living in these traditional Balinese bee hives located in different locations all over the garden. After a few months we were able to harvest the first honey. It was quite difficult to extract the honey from these traditional bee hives and the men doing it had to operate with a lot of care. Since then, the bee population has increased, thus more honey is being produced. To give more space to the bees and to facilitate our honey production, we decided to move the bee family from the traditional Balinese bee house into a new house. In this classical, western bee stock it will be much easier to extract the honey. The relocation of the bee family was not an easy task. 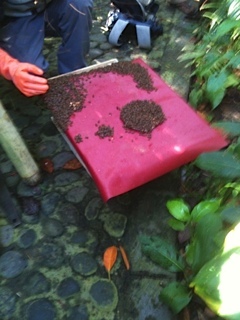 But now they are living in the new bee stocks and we are excited to see how much honey can be produced. We will keep you updated !